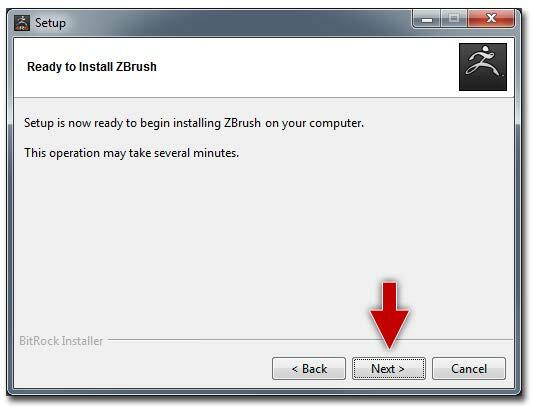 Please follow these steps to install ZBrush on your computer. 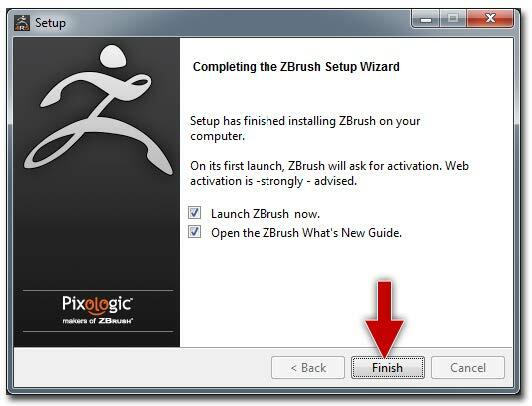 Whether you are upgrading an existing copy of ZBrush or install­ing it for the first time, these steps are the same. The screenshots displayed in this document are the ones corresponding to the Windows version but the macOS installer has the same interface and options. It is important that you be logged into the computer under an Administrator account when installing and activating ZBrush. After activation, any user on the computer will be able to run ZBrush. The screenshots have been taken with the English language version of the installer application. If you are using another language, the screens will read differently from what is shown here but the steps will be identical. The screenshots in the documentation may vary slightly from what you have in your installer or in the activation process. The ZBrush ver­sion or illustrations may vary, but the process remains the same. On Windows, double-click on the downloaded ZBrush installer to launch it. From this point it may take a short time for the installer to unpack itself to memory and continue to the next screen. Please be patient. You should also see a UAC (User Account Control) warning. Click “Yes” to continue. On macOS, double-click the downloaded DMG file to mount it. This will usually open a window that shows the installer ap­plication. If no window opens automatically, locate the ZBrush installer in the Devices section of your Finder window. Open that to locate the installer application. Double-click the installer application to launch it. From this point it may take a minute or two for the installer to unpack itself to memory and continue to the next screen. You will also be asked for your macOS login user name and password. The installer’s first step will be to ask which language you prefer to use during the setup process. This language will also be set as the default language for ZBrush itself. Click in the dropdown menu to select the language of your choice, then click OK to start the installation process. After clicking OK, the only way to change the installer language choice is to quit the installer and restart it. You can change the ZBrush language at any time through the Preferences >> Language sub-palette in ZBrush itself. The Welcome screen is only informative. Press the “Next” button to continue. Please read the ZBrush End User License Agreement. By installing ZBrush, you agree to rules and conditions concern­ing its use. This is a legally binding agreement. 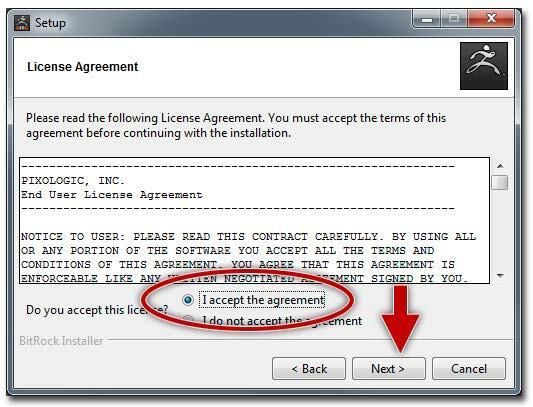 If you agree, click the “I accept the agreement” radio button and then press the “Next” button. If you do not agree, the installation will be cancelled. In other words, installing and running ZBrush constitutes your legal agreement to the terms and conditions set forth by the EULA. 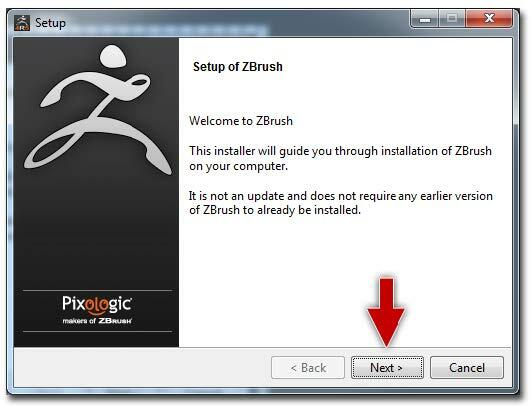 The installer specifies a default path for where ZBrush will be installed. On Windows, ZBrush will be installed in the C:\Pro­gram Files\Pixologic folder. On macOS, it will be installed in Applications. If you are satisfied with the default location, simply click the “Next” button. 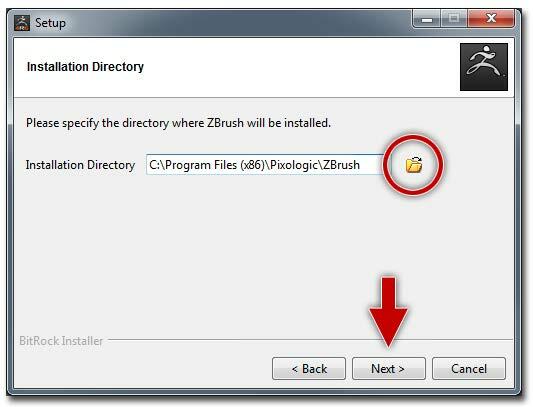 If you wish to install ZBrush to a different location, click the yellow folder icon. This will allow you to browse your hard drive and select an installation folder of your choice. When done, press the “Next” button. The ZBrush installer lets you choose which items you wish to have installed. While ZBrush itself will always be installed, you may opt out of the software’s documentation and/or official plugins. 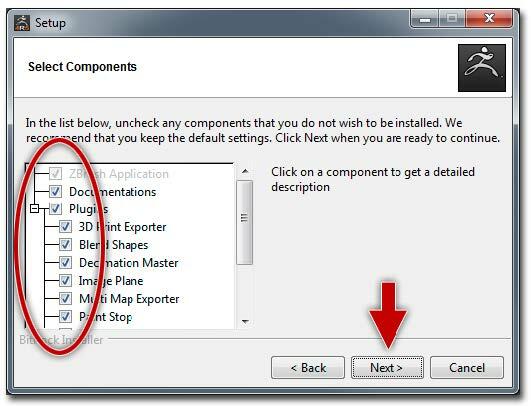 It is recommended to use the default option and install all components, but you may uncheck any components that you wish to skip. When done, press the “Next” button. It is recommended to install all components. However, if you skip any items now and later decide you would like them you can run the installer again. Doing so will let you modify your existing ZBrush installation, changing the installed components. 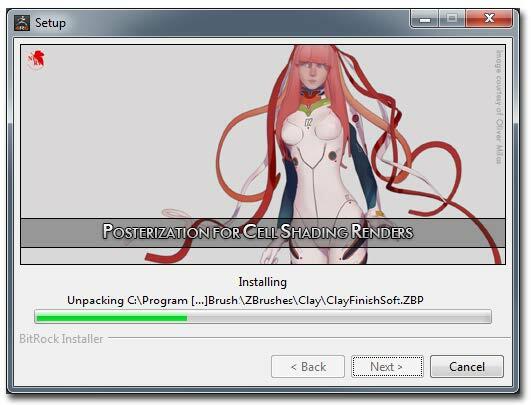 The installer now informs you that it is ready to install ZBrush. Press “Next” to start the actual installation process. The installer performs its tasks. Be aware that installation may take several minutes, during which your computer can become slow or unresponsive. It is recommended to not multi-task while the installation completes. During this time it will display a slide show of various images created using ZBrush. After a few minutes, the installer will ad­vance to the next screen automatically. The installer now displays its final page with options for what you would like to have happen when the installer closes. You may view the “Documentation,” open the “ZClassroom” to watch the many video tutorials for ZBrush, and of course you may launch ZBrush itself. Use the check boxes to select the items you wish to open and then click the “Finish” button. The installer will close and any items that you had selected will be opened.